I hope everyone had a wonderful weekend! While trying to catch up on my reading list this morning, I came across a new challenge: I thought this sounded like great fun, so I told my hubby about it. I wish I had a photo to show the look on his face. He was clearly amused and trying very hard and rather unsuccessfully to hide it. Then he offered to time me. So, I'm not the fastest when it comes to crafting and I can be a bit meticulous, but if you want me to do something, just imply that I can't. The challenge was on! The finished card took 9 minutes and 35 seconds. I wanted to put one or two more snowflakes on, but they kept breaking when I covered them with glue, so the finished card only has one lonely little snowflake. I have to admit that as someone who works slowly and deliberately, this time crunch was rather stressful and this is probably one of my least favourite cards so far this year :( However, it is nice to have a Christmas card done so quickly. At first I thought I would never do this again, but then I reconsidered and am definitely going to try again to see if I can do better. It was a very difficult challenge, but that is part of the fun and it should only get easier with practice (I hope!). Thanks for stopping in! I hope you can come join in the fun. Welcome to the dark side...the sticker side ;) Sometimes those faster cards (or pre-made embellishments/images) feel that little bit like cheating, but when the Christmas card crunch is on you'll be back :) lol! I'm the same way - should someone imply I'm unable to do it, then look out! I love those little meece, and working with glitter in less than 10 minutes? Holy moly! Hi Dawn and thanks for your fabulous comment. I love your CAS card and adorable image, I love your beautiful snowflake and your glittering!!! 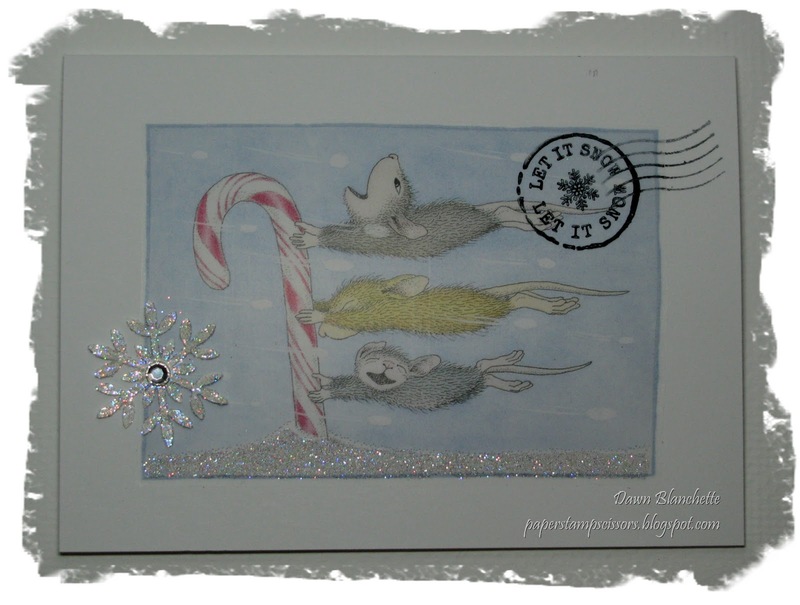 Thanks so much for joiing us both with House Mouse and Friends challenge. and Simon Says Stamp challenge. SUPER cute! I'm impressed that you got that colored in under 10 minutes! Thank you for playing along with us over at the Simon Says Stamp Challenge Blog! I think your card is adorable and in such a record time to boot. Good for you. Thanks for joining us this week at House Mouse. Best of luck to you. I love hearing the stories "behind the scenes" of playing along in the new challenge. I wish you could have snapped a pic of your hubby's face! This card is great- I'm impressed you glittered that snowflake in that short amount of time! Thanks for joining us in the 10 Minute Craft Dash, Dawn! Gorgeous cute HM creation whether it 10mins or few hrs it looks great, love the sparkle too..
fab take "Double Trouble" chall theme. Thanks for sharing with us at HM & friends chall this time..hope to see you again soon. I met my awesome ;) husband 12 years ago and together we have a wonderful 4 year old son. We live with our cat in sunny Edmonton, Alberta (Canada). Well, it's sunny some of the time. Ok, at least 10 days per year. On the bright side, that leaves lots of days for scrapbooking, which I started doing about 8 or 9 years ago. More recently I have fallen in love with stamping. Hope you enjoy my projects!